To work for Conservation in Ethiopia – a Pilot project and the development of a long-term program for conservation and education regarding the care and preservation of ancient religious art and architecture in Ethiopia, with starting points in different professions and in cooperation with The Ethiopian Tewahedo Orthodox Church and institutions and colleagues in Ethiopia. To work for a professional exchange with colleagues in Ethiopia within the fields concerning the activities of this organization, particularly regarding the education in conservation of paintings and buildings in Ethiopia, as well as damage inventory, care and preservation of these historic buildings, which belong to the Ethiopian cultural heritage. To work for the recruitment of professionally skilled persons and institutions in Sweden, Ethiopia and internationally, while maintaining the utmost respect for the cultural and religious context of the country. To support the development of museums on national and regional level in Ethiopia, with the intention to present the cultural heritage (art, architecture, manuscripts and artistic objects) and promote deeper knowledge and responsible tourism. To work for an inter-disciplinary study of the historical, technical, cultural and religious issues associated with the religious architecture and art in Ethiopia, which becomes the subject for conservation, and for the publishing of this material. 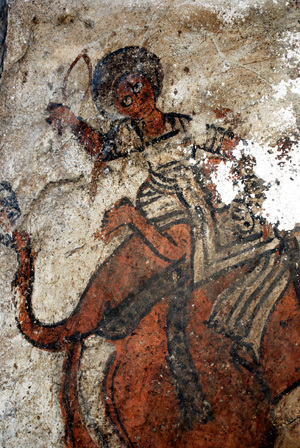 THE ETHIOPIAN CHURCHES from the 6th to 19th century accommodate works of art, which are unique and priceless, a religious and cultural heritage, which, if nothing is done, will be ruined. Magnificent paintings on walls and in ceilings, executed in al secco on plaster and in tempera on canvas glued to wall, are often in bad shape and in acute need of restoration. In Ethiopia, the professional knowledge and financial means needed to take charge of this are largely missing. Our ambition is to carry out a pilot project in one of these endangered churches and here preserve the murals and ornamental painting in need of conservation. This presupposes that technical investigations are done, working instructions are established and permissions from relevant cultural and ecclesiastical institutions in the country are granted. As an answer to the need of a domestic education an important part of the project will be devoted to apprentice education, i.e. trainees are invited to receive basic training in painting conservation on location. This will in turn create a basis for further education. As the local establishing is of outmost importance recruitment of staff, besides the trainees, will, as far as possible, be made in Ethiopia and simpler task as well as basic instructions of care taking will be handed over to the local cultural authorities and priests and monks themselves. This will ascertain that no further damages are done while, awaiting professional aid and establish a co-operation on location which is psychologically right and meaningful for all of us. An organisation named The Society for the Conservation of the Ethiopian Cultural Heritage (SCECH) has in 2011 been established in order to support the project. The members of this society represents professions on highest level as well as scientific and cultural institutions with extensive educational potential of great value at the implementation of the pilot project as such as well as at the planning of the enlarged project towards which this one is aiming. RICHARD PANKHURST is the son of the Suffragette leader Sylvia Pankhurst (1882-1960). He is a world-famous scholar of history and a central figure within the Ethiopian academical and cultural life, as well as a highly esteemed person amongst ordinary citizens of Ethiopia. He has published more than 20 books, mainly concerning Ethiopian history, and innumerable essays, not least published in The Encyclopaedia Aethiopica. 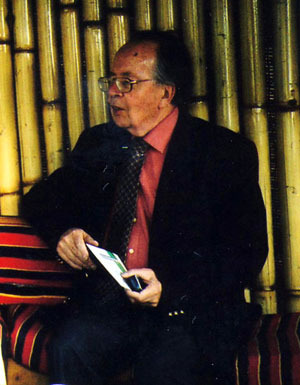 As founder of The Institute of Ethiopian Studies, Addis Ababa University, centre for the international studies of the arts of Ethiopia, since 1963 housed in the former villa of Emperor Haile Sellasie at the compound of Addis Ababa University, Pankhurst has made and still make a great scholarly and pragmatic contribution to the history and culture of Ethiopia. A sign of his position as the grand old man of Ethiopian studies is that the new university library at Addis Ababa University will be named Richard Pankhurst University Library. Professor Pankurst has ever since the first preparations of this project given his full support and is a spokesman for the aim of our society. Please, find below his Letter of Recommendation. I hereby have the pleasure to recommend “Conservation in Ethiopia – a Pilot project”, i.e. a model of how conservation of ancient Ethiopian art on a larger scale can be accomplished in Ethiopia. The project will also include a didactic part with the aim of educating Ethiopians in painting conservation, and will be done in co-operation with Chalmers University of Technology, Sweden, The Royal Danish Academy of Fine Arts, School of Conservation and domestic cultural and ecclesiastical institutions in Ethiopia. 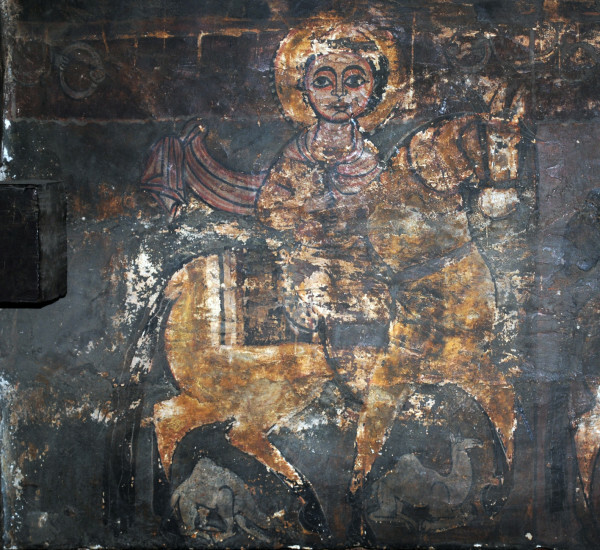 It is governed by The Society for the Conservation of the Ethiopian Cultural Heritage (SCECH), a non-profit organization, and will be carried through by a Swedish team consisting of Lars Gerdmar, Icon Painter, Restorer, Independent scholar of Byzantine art, Carmen Deas, Painting Restorer, specialized in medieval Latin and Byzantine wall painting, and Karl-Gunnar Olsson, PhD, Civil Engineer, Building Expert. The medieval sacred art of Ethiopia constitutes an important part of African art and of World Heritage. Unfortunately, today we see these treasures falling into decay. As Founder and First Director of the Institute of Ethiopian Studies, dedicated to international research in the arts of Ethiopia, for more than 40 years I have been able to follow this sad development. The situation is alarming and measures have to be taken. Therefore it is with pleasure that I have seen Lars Gerdmar’s efforts to pave the way for this project here in Ethiopia. On several occasions in Addis Ababa I have discussed with him questions connected with this project. SCECH and its collaborators has a long-term plan starting with the pilot project and leading up to a major program of conservation and education. The project is well-established on a national as well as regional and local level, and the selection of Yemrehanne Krestos, Amhara, the church to be conserved, is well conceived. The newly completed examination and subsequent report, shows in a convincing manner the significance of this church and the urgency of the need to conserve its murals. What also speaks in favour of Gerdmar and this pilot project is his familiarity with Ethiopia. Being both icon painter and restorer, and after long periods of travel in the Ethiopian highlands, he is well acquainted with priests and monks and knows how best to co-operate with them. A good dialogue on location is a recipe for success with such projects, and Gerdmar’s knowledge of local conditions ensure that these projects will run smoothly. I warmly recommend SCECH’s pilot project, managed by Lars Gerdmar and the subsequent conserva-tion work in Ethiopia by his team and hope the needed funds will be forthcoming.